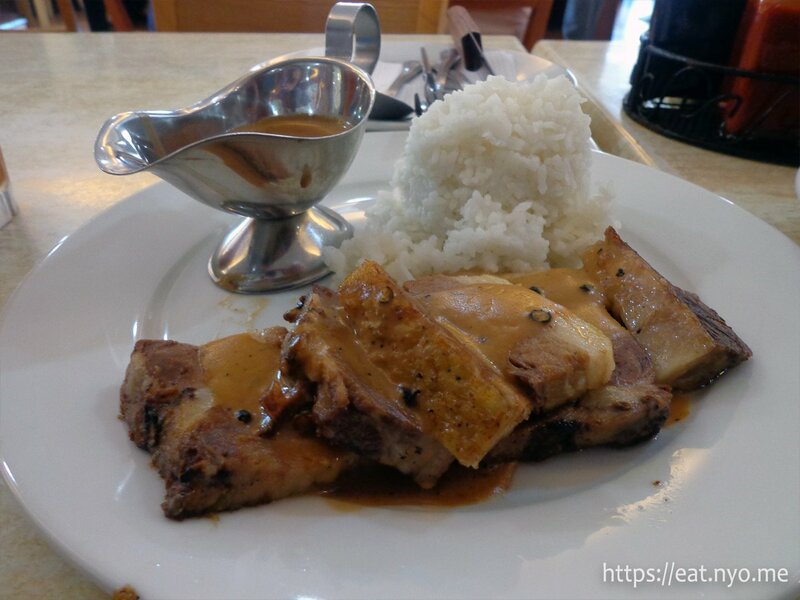 The next day in our Subic adventure, we searched for a top-rated restaurant in the area based on our research. After finally finding the correct road while walking around the bay area, we finally made it to Meat Plus. This place serves freshly-imported meat from U.S.A., specifically specialty steak cuts. The place has a refrigerator where it featured different cuts of steak you’ll get from a grocery in the U.S. You get to pick a steak cut you want and charge you additionally for cooking. You can also buy the steak and take it home. Since we were just tourists, we were sort of forced the first option. Aside from that, they also offer some more affordable options in their combo meals. 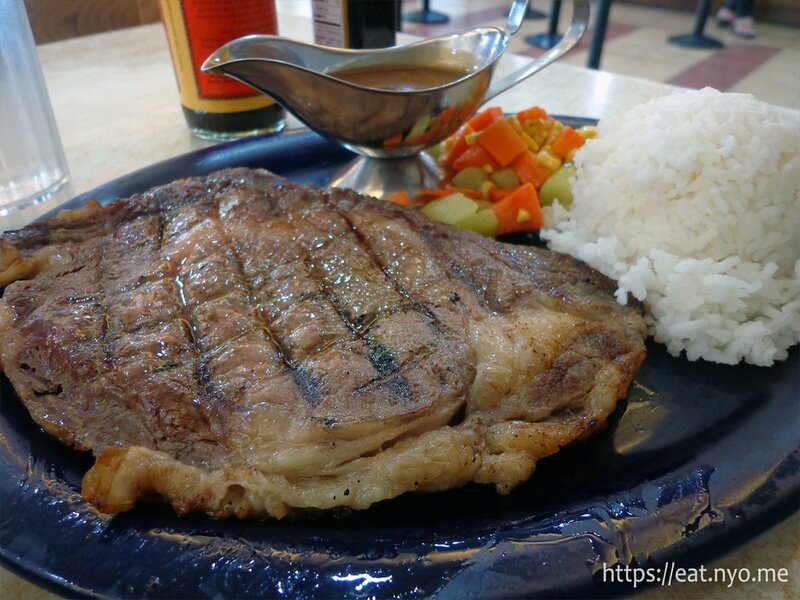 We got their Boneless U.S. Angus Rib-eye priced at 1,735 Php. per kilogram, and we got about a third of a kilo which totaled 581 Php. Plus the cooking charge of 120 Php, the entire bill for the steak was 701 Php. While pricey, this was more or less in line with my expectations given the choice cut and actually quite cheaper compared to competition in Manila. We also got their Combo Meal 7 which comprised of oven-roasted beef belly with soup, rice, and drink (265 Php). Finally, I also got an order of their French Fries (55 Php). I asked the Boneless U.S. Angus Rib-eye to be cooked medium-rare. It was nicely cooked—juicy on the inside and had nice grill marks on the outside. The steak was thick enough to be shared, but was just enough for me. There were side carrots and corn as well as a cup of rice. Funny thing we noticed was the gravy tasted similar to one you’ll get from Jolibee, so I opted to use the steak sauce and Worcestershire found in the table instead. The beef belly in their Combo Meal 7 is one of the softest, most tender pieces of meat we’ve had yet. Both me and Beloved preferred this dish over the steak just because of how wonderfully soft and tender it was. It was a nice pair with rice that caught all its juices and sauce. The gravy included is similar to the one given with my steak, which we didn’t use. This one didn’t need any sauce. 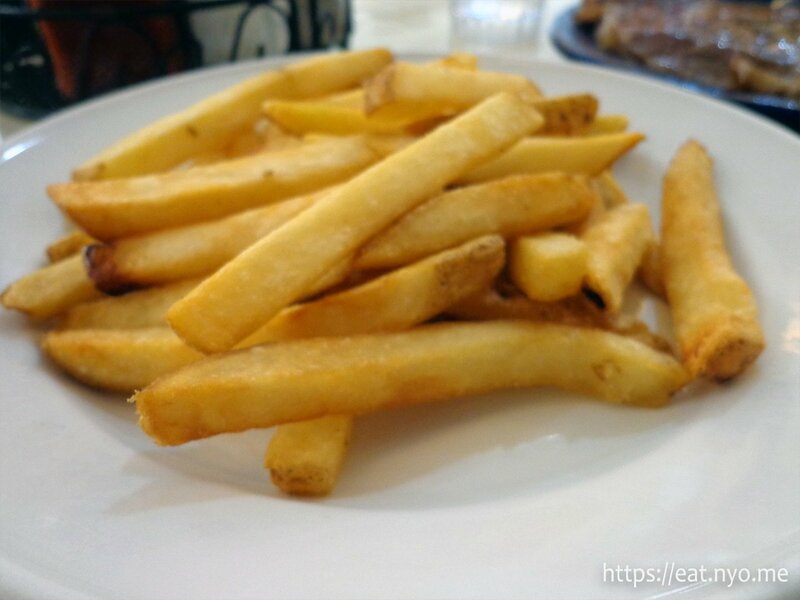 Their French Fries were thick-cut fries that were crisp on the outside and fluffy on the inside—the usual fare. Honestly, it felt out of place since our dishes already had rice with them. Meat Plus definitely had good meat. Sadly, the more expensive, imported steak we ordered seemed inferior compared to the cheaper dish we ordered. It’s not that the steak wasn’t good—it was. It’s just not the best we’ve had. And, compared to our other dish, it makes me wish we just had two orders of the Combo Meal 7, or maybe try out their other combo meals which featured other relatively cheaper meat dishes and barbecues. Still, I understand why this place is rated highly. If you’re having steak or meat cravings, this is definitely the place to go. And for the location, this is certainly a must try. Budget: ~300-600 Php per head. Not recommended for: Vegetarians and vegans. Smart nomnomnom tip: Have your steak at most medium rare.